​Steve Thompson (Lancaster) is a regular guy in love with Anna (DeCarlo), his ex-wife, who just happens to be married to local hoodlum Slim Dundee (Duryea). When Slim catches to 2 lovers together they create a diversion by coming up with the perfect armored car heist. Steve is the inside man and Dundee provides the muscle, but Steve & Anna plan a double cross to get away together with the money. Because there are double crosses built into double crosses nobody knows where allegiances lie until the final fateful frame. ​Criss Cross opens on an aerial shot of Los Angeles, descending slowly to a parking lot where a couple is caught in a surreptitious embrace by the roaming headlights of a passing car. Steve & Anna are clearly hiding from someone of great menace, plotting a getaway & wishing away their current plight. 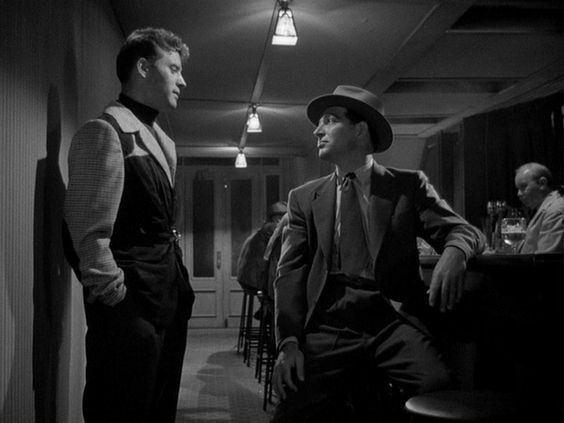 With typical Robert Siodmak conciseness this brief scene paints a very clear picture of what is to come: There will be a crime. There will be a double cross. And Anna will manipulate Steve throughout. Her patter falls into Steve’s star struck eyes. “If only it were this time tomorrow,” she pleads. “Everything that happened before between us… I’ll make you forget” taking him further from reality. “It’s just you and me like it always should have been,” finally separating him fully from any sense of the present danger. She has him twisted around her finger and Steve, like the viewer, has to believe in her sincerity, but that is immediately shattered when she walks away from Steve, into the restaurant and coolly lies to her husband, dismissing him. 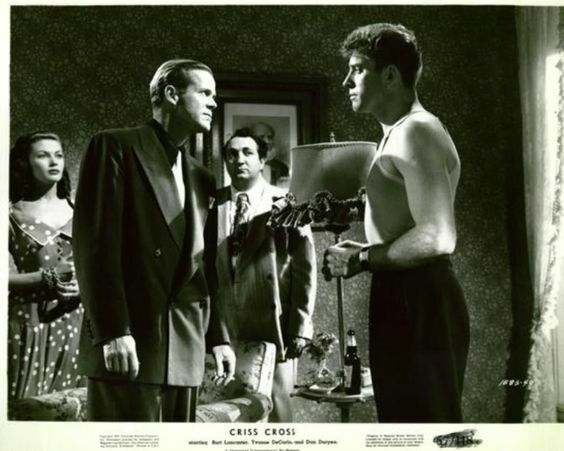 Within 5 minutes of Criss Cross’ opening, then, the femme fatale has been established, as has the love triangle and as Anna’s husband, Dundee, quickly establishes his attitude towards wife & workers, the viewer understands the stakes of the double cross as well. Steve Thompson is not a thief, but he does come from a long line of Noir pansies that are manipulated by a conniving femme fatale into becoming one. 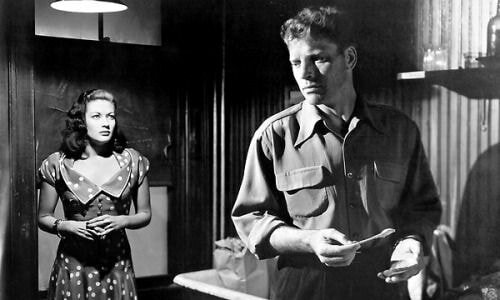 In a performance & characterization reminiscent of Ole Anderson in The Killers, Burt Lancaster wonderfully portrays a love sick child incapable of separating his blind love for a woman and his own self-preservation. He is coddled by his mother; condescended to by his friend Pete Ramirez & treated with kid gloves by his fellow guardsmen & the bartender at the Round-Up alike. Everybody worries about Steve because they understand that he is helpless in the clutches of Anna and doomed because of it. While the opening scenes takes place the night before the heist, most of the film is told in flashback, helping to flesh out the couple’s relationship & confluence of events that initiated the heist. Steve and Anna were married, but fought “like cats & dogs” for their 7 months together. Steve went away, working a series of dead end jobs, but like a moth to a flame (or a Noir protagonist to danger) he had to return to Anna, who has meanwhile taken up with local gangster Slim Dundee. The first time Steve sees Anna, after returning from the road, his mouth falls agape watching her dance to the sultry and sexual Rumba music. She may be momentarily unaware of her effect on him, but once she sees Steve she immediately starts to manipulate him & flirt with him, even as Slim lurks nearby. When she finally blows him off to marry Slim she ignites Steve’s passion and they begin an affair. She finally fully has her hooks in him…with an endgame seemingly in mind. When Slim catches them together the proverbial knife turns inside Steve and he blurts out a plan to rob the armored car that he drives, protecting Anna, but putting himself in perilous danger. The viewer is meant to trust Steve’s version of events, all the while his confidants verbally plant seeds of doubt that he refuses to give credence to. 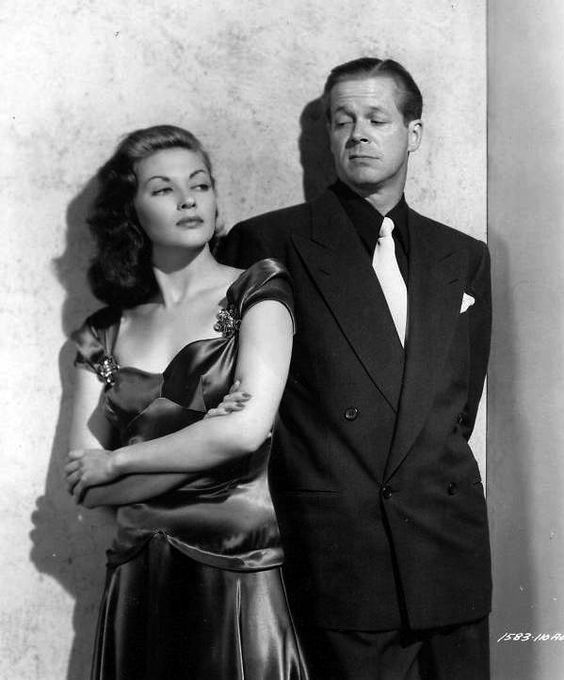 Since the heist happens in real time and not in flashback there is no doubt or cloud about what really happened, but Siodmak literally clouds the caper in smoke to give it an other-worldly appearance. Harking back to the film’s opening Siodmak starts with an overhead shot of the auto plant. When the shot final drops to ground level the scene is a pastoral of workaday life, complete with sewer repairmen, a milkman and a couple of business men in suits. When an explosion rocks the scene, the crooks spring to life, bringing chaos to the imaginary scene. Slim particularly bares his soul as he first assaults, then kills Pop (Griff Barnett), but not before sustaining a leg would in the melee. Steve, sensing a double cross to undermine his planned double cross retreats to the truck, his refuge, but is brutally attacked and rendered unconscious before the criminals flee. The smoke bombs give the entire enterprise a dreamlike quality & it is only when the scene fades into Steve lying helpless in a hospital bed, his arm elevated & casted, with bruises on his face, does the reality of what has just happened sink in. It is not the clean heist of many caper films, it is messy and confused from the get go, with the crooks only getting ½ the money, but again its appearance as a dream only magnifies its illusion. The third act is pure tension as Steve waits for Slim to exact his revenge. He is racked with guilt, fainting when he is hailed a hero for foiling the robbery, but open enough to illicit the help of a stranger to take him to Anna. His blind love for her overwhelming common sense and the inevitable double cross of the stranger who leads Slim right to their rendezvous hideout. For a brief moment before the stranger appears, however, Siodmak creates the tension of a Val Lewton thriller, complete with shadowed transoms, a creepy nurse and an empty elevator at the end of the hall, all playing off Steve’s fears that he may never see Anna again. His fear momentarily allayed, Steve is delivered to Anna, only to be chastised for his idiocy and niavete. Her true colors are revealed and Steve is once again slack jawed, staring at Anna as she explains life and human nature to him. Only when Slim appears & Anna drops into Steve’s arms are the lovers united. Presumably Steve dies happy, forever entwined with Anna in a classic Noir embrace! *Tony Curtis appears for the first time on screen as an uncredited dance partner of Anna’s during the scene where Steve sees Anna for the first time after returning from his travels. *Up until 3 months before shooting started the climax had Steve strangling Anna to death before succumbing to Slim’s bullets. Joseph Breen, head of the Production Code Administration, suggested that the strangling would be too disturbing to be shown and demanded it be removed altogether or take place off screen. Siodmak & screenwriter Daniel Fuchs scrapped the strangling helped create one of the most enduring images in all of Film Noir with DeCarlo & Lancaster dying together in a final embrace.